We are taking a look at Rock-Tenn ($RKT) this week, a name that popped up in Avondale’s proprietary quantitative value screen. The screen looks at historical financial data to potentially identify high quality companies trading at low valuations. The screen is an important part of Avondale’s investment process, but this post should not be taken as an investment recommendation. We are one of North America’s leading integrated manufacturers of corrugated and consumer packaging. serve local customers and large national accounts. We provide customers with innovative packaging solutions to advertise and sell their products. We also provide structural and graphic design, engineering services and custom, proprietary and standard automated packaging machines, offering customers turn-key installation, automation, line integration and packaging solutions. To make corrugated sheet stock, we feed linerboard and corrugated medium into a corrugator that flutes the medium to specified sizes, glues the linerboard and fluted medium together and slits and cuts the resulting corrugated paperboard into sheets to customer specifications. Our consumer packaging converting operations include folding carton converting operations as well as our 65% owned solid fiber interior packaging converting operations. We internally consume or sell our coated recycled and bleached paperboard to manufacturers of folding cartons, and other paperboard products. We are one of the largest manufacturers of folding cartons in North America and believe we are the largest manufacturer of solid fiber partitions in North America measured by net sales. cartons are used to package food, paper, health and beauty and other household consumer, commercial and industrial products primarily for retail sale. We print, coat, die-cut and glue the cartons to customer specifications and ship finished cartons to customers for assembling, filling and sealing. We also manufacture and assemble (pack out) temporary and permanent point-of-purchase displays. Energy is one of the most significant costs of our mill operations…In our virgin fiber mills, we use wood by-products (biomass), coal, fuel oil and natural gas to generate steam used in the paper making process to generate some or all of the electricity used on site and to operate our paperboard machines. We use primarily electricity and natural gas to operate our converting facilities. We generally purchase these products from suppliers at market or tariff rates. Inbound and outbound freight is a significant expenditure for us. We spent approximately $623 million on all energy sources in fiscal 2013. Natural gas and fuel oil accounted for a little less than two-fifths (approximately 39 million MMBtu) of our total energy purchases in fiscal 2013. A hypothetical 10% increase in virgin fiber prices in our mills for a fiscal year would increase our costs by approximately $70 million. Although the majority of the containerboard consumed is produced at our mill locations, we do purchase containerboard externally. A hypothetical 10% increase in containerboard costs for containerboard purchased externally, net of trade swaps, would result in increased costs of approximately $21 million in a fiscal year. A hypothetical 10% increase [in freight costs] for a fiscal year would increase our costs by approximately $89 million in a fiscal year. 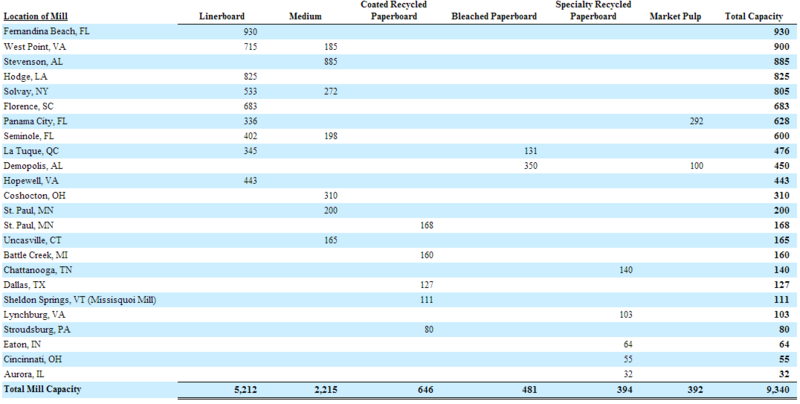 the costs of recovered paper and virgin fiber, our principal externally sourced raw materials, have fluctuated significantly due to market and industry conditions…The paperboard, containerboard and converted products industries historically have experienced significant fluctuations in selling prices…Our operations generally have high fixed operating cost components and therefore our earnings are highly dependent on volumes, which tend to fluctuate. If one cubic foot box uses 6 square feet of material then produce about 12.85 billion boxes (assume 1 cubic foot) per year. Produce 51 million boxes per day. Revenue of ~50c per box. 42 cubic foot boxes per US capita per year. (Divide by lateral length-squared for each incremental cubic foot of average box size). One ton of material makes about 1750 boxes of 1 cubic foot. If a milk carton uses about 1 sq foot of material, the paper content of the gallon of milk would be 12c or about 3.5% of the cost of a gallon of milk. that means Rock Tenn produces enough consumer paper to make 20 billion milk cartons, 66 gallons per capita per year. The average american drinks 22 gallons of milk per year. Enterprise value worth ~94 million tons of operating profit, roughly equal to remaining useful life of equipment.